I am one of those people who can’t stand clutter or things everywhere. Don’t get me wrong, I’m not a clean freak but piles of things ‘out of their place’ unnerve me. So before the festive season takes over and it’s suddenly February, I decided to make an early head start on my new year’s resolution to be more organised! This office update is a collaboration with The Reject Shop where you’ll find almost all the items pictured. 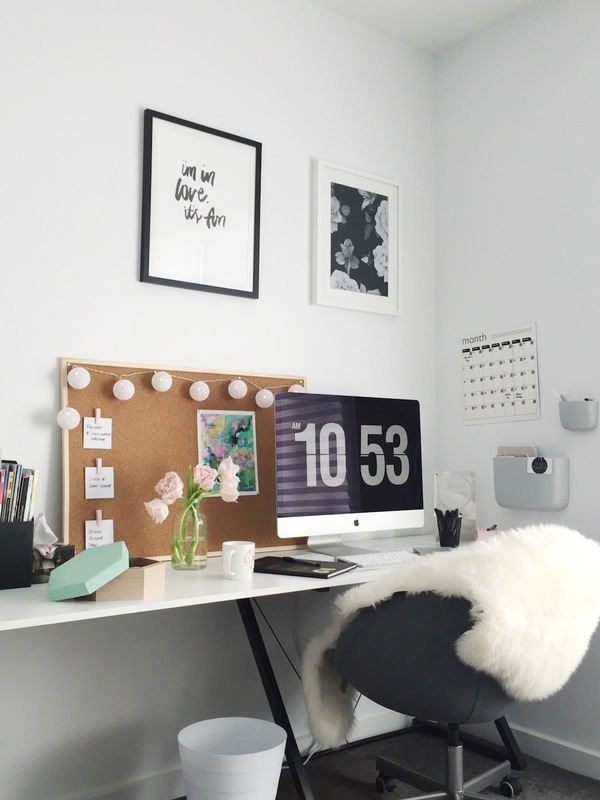 Hopefully these ideas inspire you to give your home office a makeover too! I’m forever writing lists of things to do but I know things are out of control when trying to work off 4 priority lists at once! 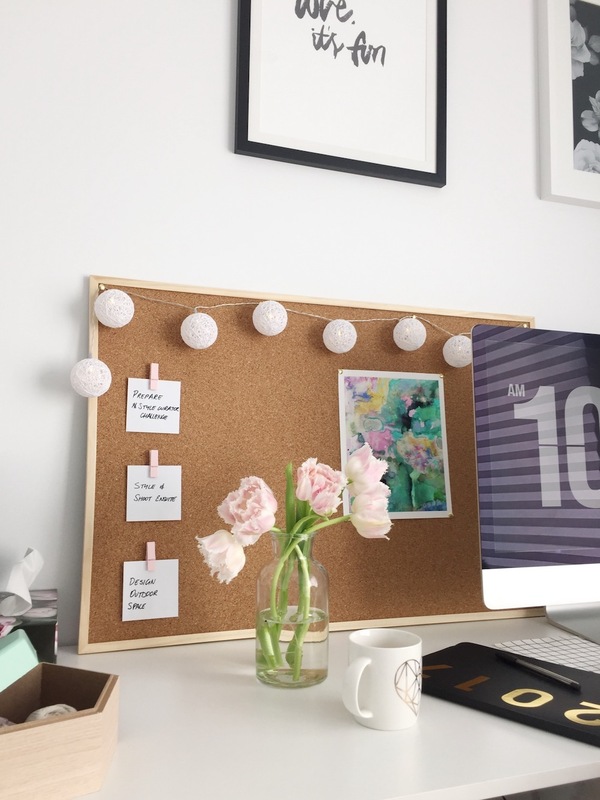 That’s why I personalised this oversized corkboard with 3 blush pink pegs… call them priority pegs if you like. At any one time, I can have a max of 3 urgent tasks I need to complete and as I get them done, they’re removed from the pegs making way for new priorities to be added. 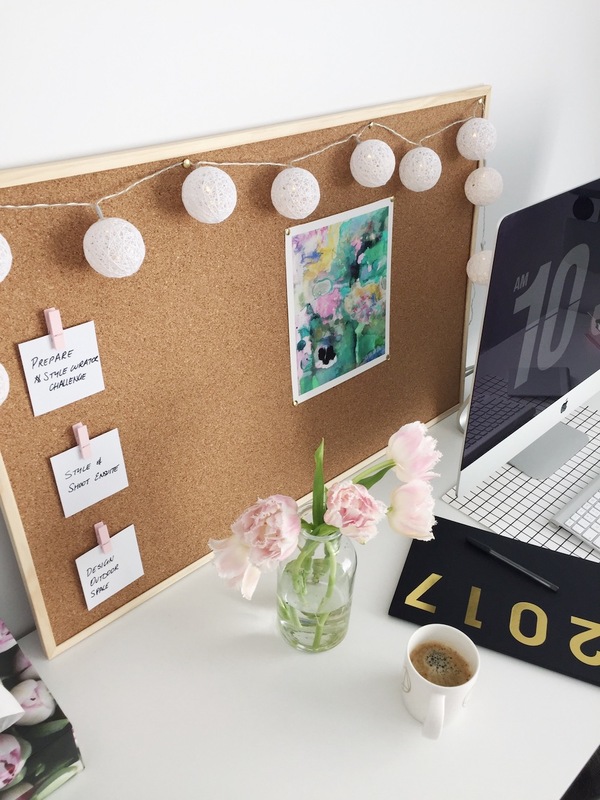 Other things to do can be added to the corkboard with regular push pins. It’s a way of being able to easily glance across my desk and know what I need to be doing without consulting ‘to do’ lists in notepads. I couldn’t resist stringing these white lanterns around the board for some added softness and warm light. I also picked up a magnetic monthly whiteboard planner where I can easily glance at the month ahead and see important dates or deadlines. Don’t let my Instagram pics deceive you, 80% of the time my desk is covered in piles of papers, products I’m styling or DIY materials. 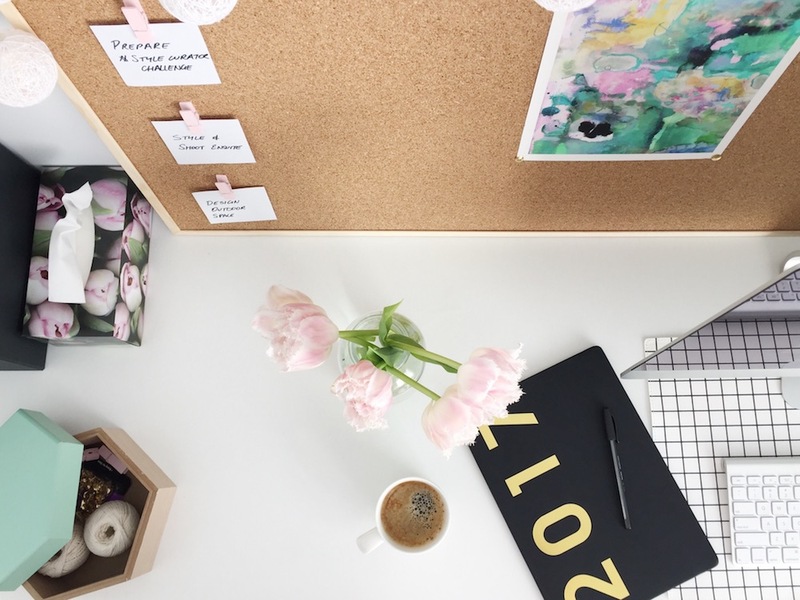 I stripped my desk back to basics and then just placed the items I need daily — pens, diary, memo box, coffee cup — on the desk and other items I need left often in the bookshelf behind my desk. Gone are the piles of papers and abundance of things that were taking over my desk. The black mesh pen holder and timber hexagonal box are great for organising items on my desk. 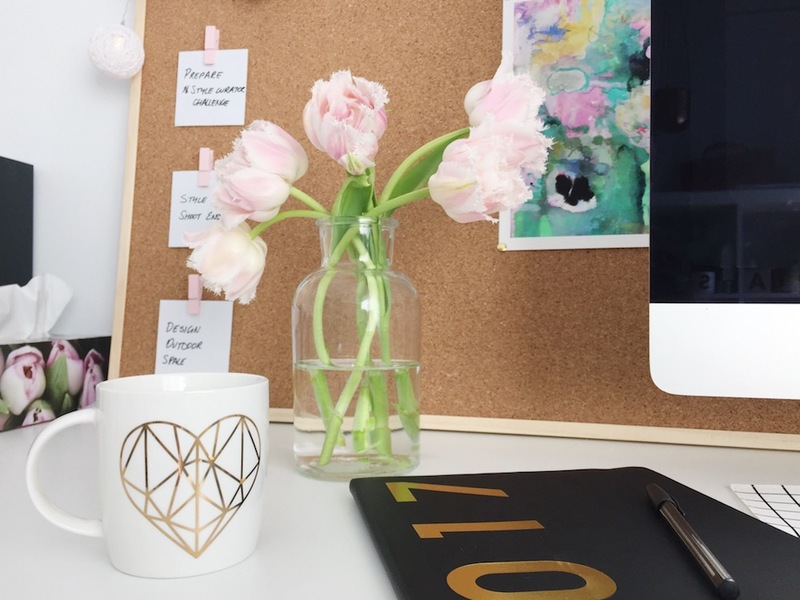 I once heard fresh flowers hold the key to better mood, empathy and innovation, and can make you more productive in an office by reducing stress and improving memory — that’s reason enough for me to have fresh flowers in my office most of the time. These parrot tulips are in a glass carafe that comes with a cork lid but used here as a vase. For some time now my office has just been black and white but given it’s summer, I wanted to bring in some soft colours. Trending in interiors at the moment are gelato shades so I selected light pink and washed out mint tones that bring a subtle amount of colour without being distracting or overpowering. Some gold accents in the diary, mug and push pins add a hint of bling. 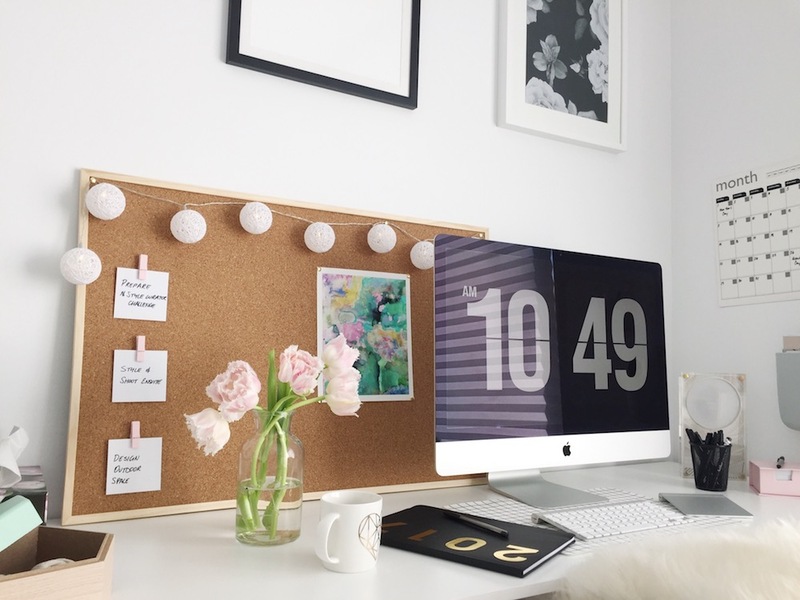 I love the fresh new feel of my office — it’s fun, inviting and creative. How does your home office feel? 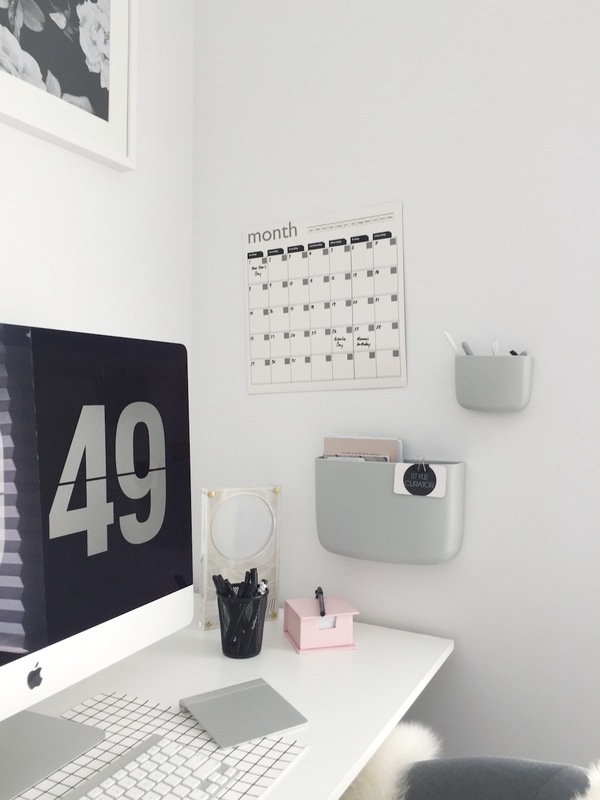 Will you try out any of these ideas to style and organise your office? For more savvy styling ideas, visit The Reject Shop blog. Hi! I was wondering where you got the grid little mat (the one that is in your computer screen and keyboard) because I’ve been looking for one for the longest time already. He he, hopefully these ideas can help change that Sarah!